I must admit, the image is rather funny. The former Bishop of Newark, and others, seem to spend much time analyzing the scriptures and tradition from a scientific, Cartesian point of view. With excellent scholarly inquiry they are quite adept at deconstructing just about anything proclaimed by the Church and just as easily apply a poetic and fitting metaphor for us postmoderns. Phew! To think all this time I had been duped by scoundrels such as Rowan Williams, C.S. Lewis, Lancelot Andrewes, Maximus the Confessor, Gregory of Nazianzus and Irenaeus of Lyons! All joking aside, I certainly can appreciate the desire to address interpretations of scripture, often called fundamentalist, that can be hateful, close-minded, bigoted, if not downright evil. I also am fully behind good scholarship and I would contend that it is the duty of every preacher (or anyone interested in scripture) to invest serious amounts of time into good biblical historical analysis and to draw on the plurality of critical investigation available to us in 2016. The intellect, reason, is critical and important. But it is only one tool, and a limited medium of exploring the infinite. The Ascension surely mirrors the incarnation. The word entered into flesh, and became flesh: heaven brought down to earth. Like a diptych, the Ascension reveals the word as deified flesh returning to heaven, drawing the below to the above, the flesh of human nature drawn into heaven. If it was a miraculous effusion of a soul wafting into the nebulous, we would be back to the same old Platonic duality. We are our bodies, nail-holes and all. Holy bodies, with a now restored nature, capable of unlimited development, capable of being turned into Christ and deified. There is no more duality, God is all and in all. Is it helpful to search for the molecular formula of such a mystery? I love my mother. Afraid I can’t prove it quantitatively—on paper my actions are just instinctual, natural self-centred biology: psychological habits according to “need theory.” Then again, I don’t know of anything more real, more true, than love. Do you? The best way to do theology is in the act of praise and worship, Eucharist, hymnody. Turning oneself over, a metanoia, where we discover this mysterious God by being discovered by him. To think we can discover God by our own intellectual effort, is surely blasphemy. Is it not best to yield to his miraculous indwelling? Is this the true work of all God’s people, prayer and leitourgia? Our God contract’ed to a span, Incomprehensibly made man. His love shall then be fully showed, and we shall all be lost in God. This entry was posted in Flesh made Word and tagged ascension, dualism, feature, science, Spong, theology. Bookmark the permalink. ← All dogs go to heaven? 38 Responses to "Fact or fiction?" But it is a contextual document – as is all writing – that needs to be read with Jewish eyes that understand as fuilly as possible what the hearers of that time would have made of this story and why the gospel writers needed to include it ion their writings. Since you asked, the mythic meaning of the Ascension is the conclusion of this story. The Word arrived from Heaven through the Virgin Birth and became fully human in This World in Jesus. ‘The Word’ was crucified and descended into the Underworld, staying three days – not a brief visit but long enough to be family. Then after 40 days of resurrected life, ‘the Word’ ascended back into Heaven, indicating it now lives ‘forever’. This Word has now become ‘Lord’ of all – of all three worlds. This 2000 year-old poetry and metaphor perfectly communicates that the Word has no boundaries. It is intrinsic to all of life. Whether in bliss or despair, cosmic compassion embraces us. Will we accept the embrace? Will we live life unintimidated by circumstance? Will we live the resurrected life individually and communally? Will we mirror the compassion that embraces us? It is grace (divine intervention) that delivers us to a place of response. I have read a book by Bishop Spong and find his views very refreshing and helpful in my understanding of the bible and my faith. It either happened or it didn’t and all the beautiful metaphors on earth will, in reality, do nothing for anyone but give them warm fuzzies which is exactly what a pair comfortable slippers will do.We are not called to put our faith in metaphors. Myths don’t have to be literal to be true. In fact, myths are often foundational in providing a sense of identity and connection. FACT……b/c I just can’t deny what JESUS has done in my life!!!!! a very good topic for oneone conversation! FACT one can ‘discuss’ intellectually or not, the Ascension, resurrection or anything else BUT if we do not attend to the cries of His Children,saved or not,it all means nothing. Btw Ken thanks for you sharing. I t meant a lot to me. Thank-you Deborah. Gospel writers came decades after the crucifixion and wanted to simply express their enthusiasm for abundant life. Ken Fisher yes but they did not write lies or myths as Peter proclaimed as Eye witnesses “For we did not follow cleverly devised myths when we made known to you the power…” an embellishment of the truth is still a lie one shouldn’t put their faith in lies or is God a discriminator of lies or “stretched” truth since the apostle were writing under the influence of the Holy Spirit. whats the problem with walking and talking thats what the apostles did .. Yes. ‘children’ today means all those around the world that are innocently suffering. They are not the cause of their suffering. Think of those women captured in Africa, the citizens of Alleppo in Syria, those with ‘boil water’ advisories in indigenous communities here in Canada, etc. Tony Houghton What if… Lies = a superficial view of life, an escape from the reality of who we are. And myths can reveal the profundity, sanctity and mystery of life. Yes, I know that one connotation of myth = lies. Joseph Campbell unbundled ‘myths’ as meaning. Little Red Riding Hood is a myth, but who among us has not been taken in by ‘a wolf pretending to be a grandmother’? eat and drink ,for tomorrow we die ,and that’s it. Tony Houghton yes that is what they did and that is why Jesus clarified “do unto others” not talk onto others. Talk has always been cheap. Ken Fisher why “think” so far away. That is too safe. I am pretty sure that you could walk outside your door and meet some one. Of course. Our children are everywhere. Ken Fisher God did not call us to have a faith built on myths. If Jesus was not literally, God incarnate ,born of a virgin,live a perfect life ,die on the cross,bodily raised from the dead and ascended to the throne in heaven, then let us, as Paul puts it Corinthians, eat and drink ,for tomorrow we die ,and that’s it. Deborah Bethell It is kind of hard to spread the good news if we were all silent ,it would also put all preacher out of work ,maybe what you meant to say is the those with opinions contrary to your own should be silent.By the way your quote of Jesus has nothing to do with not talking .We are called to make disciples ,that is impossible without speaking ,we are called by Paul to ” reprove, rebuke, exhort with all long suffering and doctrine” kind of hard without speaking. That is exactly why the church is in such a mess. By their fruits ye shall know them. Gandhi once said that he would have become a Christian if there was not so much infighting amongst Christians. He did not need to leave his tradition to find that. The church needs to be less pious and get their hands dirty. Tony Houghton. No doubt at all the Jesus really lived and really died on the cross. The ‘resurrection’ of Jesus is a metaphor for the appearance and liveliness of the Christian community, which you and I embody, as part of the Church. The man Jesus, died. After which, his followers were left to describe him and his impact. They decided to call him the embodiment of love, the anointed one, the Christ! The decided that the Word that he embodied, the Word of forgiveness and invitation to live life fully, that that Word, was Lord of All. They witnessed to their experience. The existence and continuance of the Church is the Resurrection. Here is the divine gift. It is not based on exclusive magic, as in ‘our guy physically went to heaven’. It is based on an historical event in which the ever-awesome divine love, became alive in a new and inclusive form now called Christianity. As Deborah Bethell emphasizes, acts of love continue to bring this into our immediate reality. Ken Fisher Hmmm… The resurrection on a personal sense is that Christ is alive and well in the Heavens BUT is also alive in me. When I talk to Him He listens. He may not agree with me but we have that communion which is available to everyone. To explain it away as a metaphor waters it down somewhat. That omnipresence, eschatologically levels time, unites the saints (including you and me) reaching universality and treasures the individual in all history – yesterday, today, tomorrow. He knew, knows, our names while in our mothers’ wombs. Happy Mothers’ Day BTW and yes, we are so special! Ha! Ha! How’s that for talk Ken and Tony! Have a wonderful day guys! Ken Fisher If all Jesus was,a man who live once said some good things and died on a cross like thousand before and after him, we are still dead in our sins ,his death as thousands before and after him offers us no benefits. If He was not God incarnate and lived a sinless life ,which would be impossible for a “regular” man to live a perfect , sinless life, for they would be in Adam and be born with a sinful nature ,He would be in the same predicament as the rest of us. Not only did Jesus die a death we could not die but he lived a life that we could not live ,which becomes ours when we believe in Him.”1 Cor 15 “Now if Christ is proclaimed as raised from the dead, how can some of you say that there is no resurrection of the dead? But if there is no resurrection of the dead, then not even Christ has been raised. And if Christ has not been raised, then our preaching is in vain and your faith is in vain.” If Jesus resurrection was just a metaphor ,your to will be a metaphor, for his ascension and resurrection was a example of ours 1 Thess4:14 “For since we believe that Jesus died and rose again, even so, through Jesus, God will bring with him those who have fallen asleep. Romans5:6 “…we shall certainly be united with him in a resurrection like his.”. If Jesus resurrection and ascension was just a metaphor then a metaphor is all you have to look forward to,here and in the future. Again I put my faith in what really happened ,not in metaphors Happy Mothers Day Deborah,mothers are very special. 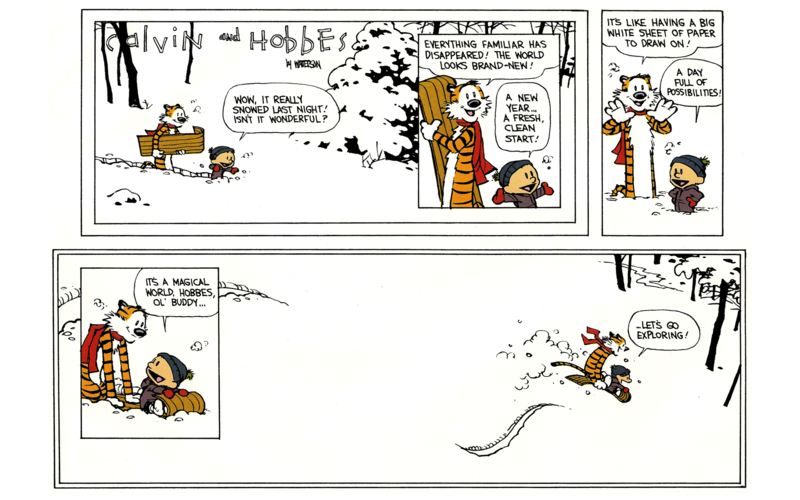 Tony Houghton I visited your page and saw Calvin and Hobbs! We raised our children on Calvin and Hobbs (and of course about Jesus). Calvin and Hobbs brings life to the living level. It is so important to be able to walk into a room and people sense the Spirit. Bless you and may the child within us reflect that love and grace of the Spirit. Bless you. I have also learned to let God defend Him/Herself. It was such a difficult lesson that I am still learning and Calvin and Hobbs helps me see the trees instead of the forest. BTW Hobbs is real…. No one can change my mind on that one… Or my husband’s or son’s… Some things are still an act of faith … Hugs! Tony Perfect! I like that too! I love being a part of the Anglican (Episcopal) church where we are invited to deeply engage these and other theological questions.